We recently added a 10 month old puppy to our family. He is a Shar pei – Lab mix and, aside from being my son’s new best friend, is my constant companion in the kitchen when I cook. He loves the end pieces of squash, carrots and tomato cores, and lays in wait for anything that happens to fall to the floor when I transfer foods from the counter to the stove. It is great to have a dog in the house again! I harvested some of my parsnips today. I am rather excited about how well they have done; it is the first time I have grown them. 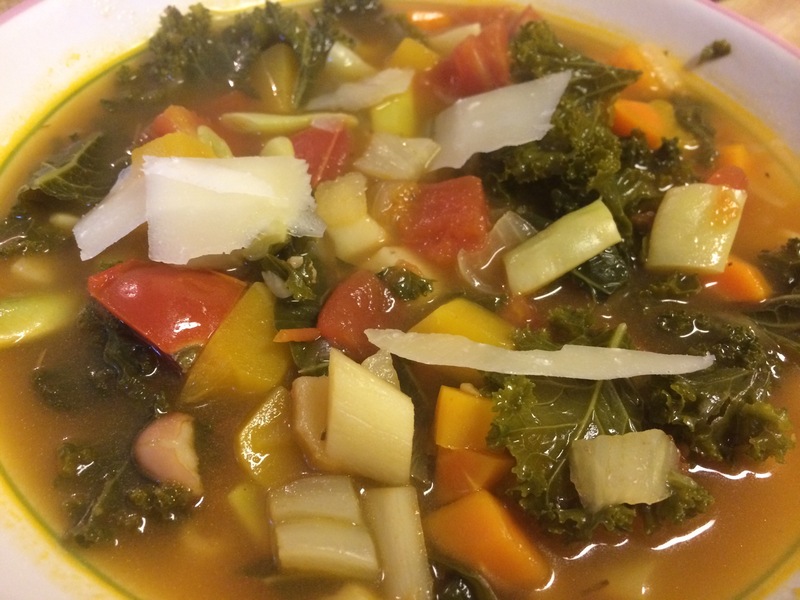 To celebrate, I decided to make minestrone using the parsnips, carrots, yellow beans, and garlic from the garden. 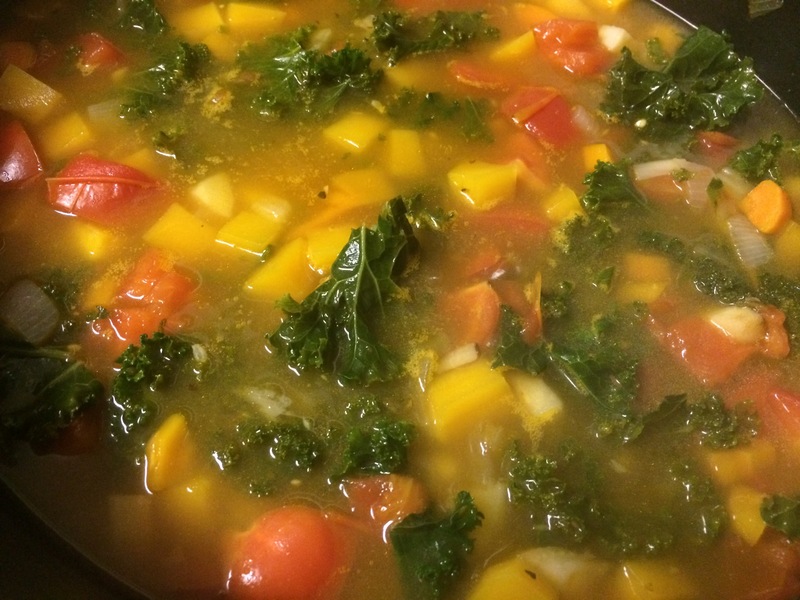 To that I added kale, fennel, onions, plum tomatoes and butternut squash that I had to purchase since I do not have any in my garden right now. The prep time for the vegetables was significant, it took almost 45 minutes to get my mise en place ready. 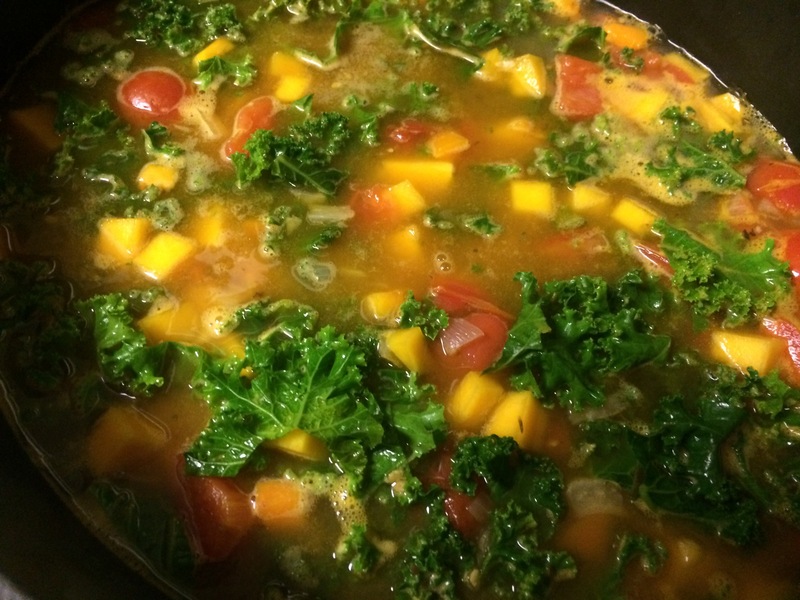 Once that was done, the soup was fairly simple to make, just a series of additions and cooking. Altogether it too about 2 hours from starting to chop to eating the soup. It was time well spent the soup was delicious. Light and fresh tasting, yet filling and satisfying. I am glad there are leftovers for tomorrow’s lunch. In an 7 – 8 qy dutch oven or pot, heat the olive oil over medium heat. Add the carrots, parsnips, fennel and 1 tsp salt. Cover and cook, stirring occasionally, until the onions are translucent, 5 – 7 minutes. Uncover and continue cooking, stirring occasionally, until the veggies are a bit shrunken and you are starting to scrape bits off the bottom of the pan. Add the garlic, crushed red pepper and black pepper and stir until fragrant, about 30 seconds. Add the tomatoes and oregano and cook, stirring accasionally, until the tomatoes are mostly broken downand the mixture starts to look thicker, 10 – 12 minutes. 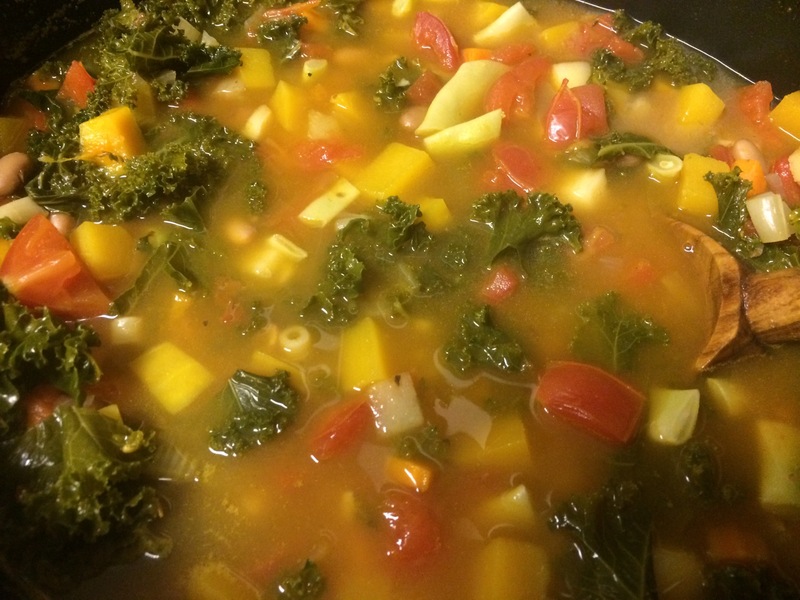 Add the butternut squash, kale, parmigiano rind, broth, 4 cups of water and 1 tsp salt. Bring to a boil, reduce to a simmer and cook, stirring occasionally and scraping the bottom, for 5 – 7 minutes. Add the pasta and cook for another 6 – 8 minutes, stirring and scraping occasionally. Add the green beans and pinto beans and cook for 4 – 5 minutes more. Remove the pot from the heat, if you can find it, remove the parmigiano rind, and sit in the balsamic vinegar. Taste and adjust the seasoning or vinegar if necessary. Serve with shaved parmigiano and enjoy!